Over 400 years of brewing tradition at the Abbey of Notre-Dame de Saint-Rémy which brews the Rochefort beers is under threat. They have been drawing their water from a well on their site for centuries. This is now under threat as a nearby quarry wants to dig deeper. This will dry up the Tridaine, an underground spring and the source of their water. It will also have a knock on effect for local flora and fauna. Yes, an alternative water supply will be supplied but it will certainly change the character of the beer. It will only take a few moments of your time but could possibly save hundreds of years of tradition. Signed. Don't MESS with Rochefort! 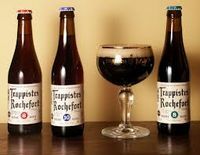 The best of the Trappists, IMHO.